The best Christmas presents are always the unexpected ones, and one that I certainly wasn’t expecting was this volume: Huddersfield’s Roll of Honour, 1914-1922. Thank you, Jo and John. The book is a work of extraordinary scholarship, by Margaret Stansfield. In 1985 she joined a tour of the Great War battlefields in France and Belgium, and because of the experience was moved to compile a full register of all those soldiers (and sailors, too) from the Huddersfield area who died in the Great War. This book is the fruit of her labours; it contains 3,349 entries, each recording everything she has been able to discover about a particular soldier. Typically this includes his date of birth and some family details, including the family address; the school he attended, and his work; his regimental number, and his unit; details of his death; details of where he is buried, and the Huddersfield memorial on which he is listed. 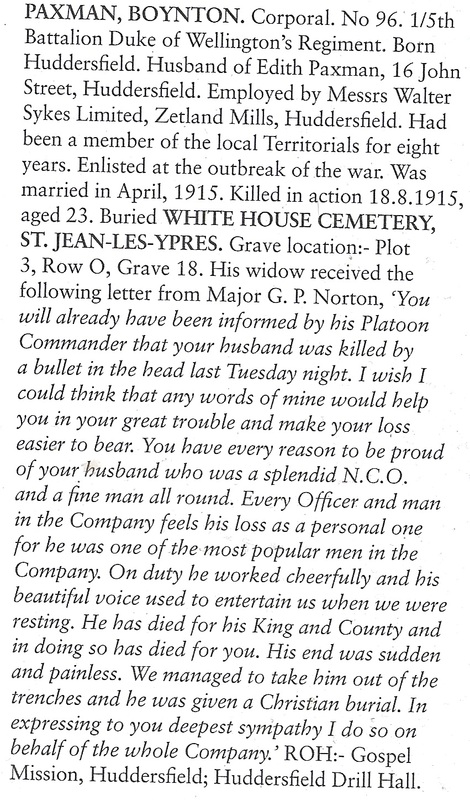 In many cases there are quotations from letters home from officers or comrades, explaining how the man was killed. Many of these include consoling words such as ‘I am glad to say he had no suffering as his very sad death took place instantaneously.’ Well, sometimes these kindly-meant words were true, I expect. Since he died in January 1916, this man was not a conscript; at 55 he was also, surely, an unlikely volunteer. My first guess was that he must have been a pre-war regular who gave in under the strain of industrial warfare, but the 1911 census shows him living in Huddersfield and working as a labourer. He had seven children. Huddersfield has been fortunate in its local War historians: Cyril Pearce’s research into war resisters is unique in its presentation of a wartime radical community, and this labour of love gives the other side of the picture, showing the cost of war to those who went to fight. I moved to Huddersfield a couple of years ago, so I find this record of diverse local lives cut short by war especially interesting, but any student of the period would find much here to think about. There is a hint in the introduction that the information is going to be put into an electronic form, and I can see the usefulness of this. In book form it is a mass of detail ordered only by the soldiers’ names. A database could reveal patterns in the casualty list: what ages were likeliest to die; which areas of the town were most afflicted, and so on. It could also, perhaps, include the photographs and documents that Margaret Stansfield collected. In the meantime, the book offers plenty to think about. This entry was written by George Simmers and posted on January 8, 2015 at 11:12 am and filed under History, memory. Bookmark the permalink. Follow any comments here with the RSS feed for this post. Post a comment or leave a trackback: Trackback URL. “My first guess was that he must have been a pre-war regular… but the 1911 census shows him living in Huddersfield and working as a labourer.”! A reservist called back, perhaps? Or an ex-soldier like my grandfather. He’d been a sergeant-major in the Royal Engineers and had retired in 1912. I don’t think he was in the reserves, but in 1915, at the age of 46, he re-enlisted. According to “Huddersfield in the Great War”, Mosby did indeed re-enlist in 1915. More intriguingly, the book says that, following shooting himself in the barracks, Mosby was taken to hospital for treatment, where he finished the job by getting hold of a knife and cutting his own throat. I take it this information comes from records of the inquest. That’s a book I’ve been meaning to read. I wonder if the Huddersfield newspapers have more details. I’ll try the local studies library. This is fascinating stuff, George. I am in awe of someone who can devote so much time and energy to such painstaking research over what must have been many, many years. But it’s probably the most valuable work that can be done, getting us away from airy academic generalisations about power politics and national survival and bringing us to the individual human stories of the war. When I read Geoffrey Moorhouse’s “Hell’s Foundations” some years ago I remember thinking how wonderful it would be if an equivalent book were written for every major English (and Welsh and Scottish) town. From what you say, it would seem that Huddersfield, at least, has been properly treated.